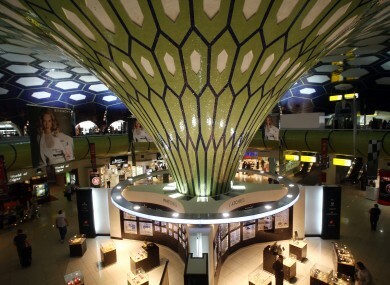 General view of Abu Dhabi International Airport duty free shopping area at the departure gates. KEEL STEEL ENGINEERING has won a €16 million contract with Abu Dhabi Airport and will be hiring 70 engineers to undertake the work in the Middle East. The engineering company is to build a 3,500 tonne baggage handling facility at Abu Dhabi’s new Airport and work begins in January of next year. The managing director John O’Kelly says the company will be recruiting up to 70 engineers, many of them Irish, to work on the project. The 70 new recruits will include project managers and engineers to be on site in Abu Dhabi to start work from January. This is one of the firm’s largest projects to date and is due to be complete in April 2016. John O’Kelly says he likes to foster links with Irish third level institutions such as University College Dublin and Dublin City University, with his company offering internships to engineering graduates. He says it gives the “engineers of the future hands-on, practical work experience and internships at its sites in Dubai, Ras Al Khaimah and in Abu Dhabi”. The new work opens up significant new opportunities for other graduates, he says. “I left Ireland at the start of the last recession in 1982 and have kept very close contact with home. Four of our 5 children are back studying in Ireland. We’ve always been keen to encourage young Irish people in whatever way we can – to give them a start in their careers and a foothold in the Middle East. There’s been a huge influx of Irish people here in the past five years and we’re very well thought of by the government, the authorities and employers.,” he said. We’ve done a good deal of work with relocated firms such as John Sisk and we have imported steel directly to Abu Dhabi Financial centre from a production facility in Kilkenny from Michael Whelan of SRS. We plan to partner more and link up more with Irish-based firms thinking of using a Middle East based company for either representations or for Joint Venture. “I understand what it’s like to be isolated from family and immersed in a very different culture and environment at a young age. It’s a very different way of life out here but people are very secular, tolerant and welcoming,” he said. Kelly Steel Engineering is already recognised as one of the Middle East’s top architectural steel fabricators, and has the largest Irish-born private sector workforce in all of the United Arab Emirates. Email “Irish company to recruit 70 engineers after winning €16m contract in Abu Dhabi ”. Feedback on “Irish company to recruit 70 engineers after winning €16m contract in Abu Dhabi ”.